Are you here as a Mom or as a Pharmacist? What percentage of children receive healthcare in line with clinical practice guideline recommendations? Jonny is 6 years old and he is about to go to a hospital for a second time in his life. He may not remember the first time, as he was only a baby, but it left him with a powerful reminder that hospitals are not a safe place to be - due to the wrong dosage of a medication he was given, he had partly lost his hearing. Luckily, Jonny's story is fictitious, but there are thousands of stories like this one which are not. Medication errors are not uncommon in child healthcare. And when they do occur, their consequences can be severely damaging to a little patient's health. In 2007, 72000 medication errors were reported in England although the number might be in fact much higher . Medication error has become an area of concern in healthcare practice - so much so that reducing its incidence has been identified as an improvement area in the NHS Outcomes Framework 2014/15. The risk of a medication error is even greater in paediatrics, where drug doses may need to be calculated based on patient's age, weight, and body surface area. The consequences of medication errors in children can also be greater than in adults - a recent study suggests the potential adverse drug reaction rate to be three times higher . In 2014, the Department of Health commissioned the Royal College of Paediatrics and Child Health (RCPCH) to develop a QI network to reduce harm from paediatric medication error in the UK. Meds IQ project was founded and subsequently launched at the RCPCH conference in April this year. In the beginning, we asked child health professionals - GPs, paediatricians, nurses, and pharmacists - about their experience of medication error. What we found out was that across all these groups, prescribing errors were the most commonly experienced (75% of our survey's respondents), particularly around drug dosage miscalculations, illegibly written prescriptions, and mistakes from previous prescriptions. We have also been told that medication information and support in communicating with families were an area of need for the child health community. With that feedback in mind, we developed the Meds IQ website, collating practical QI resources focused on 4 areas: safe prescribing, medication error reporting, medicine reconciliation, and engaging patients and families in improving medication safety. The principle behind Meds IQ is simple: we know there have been numerous innovative, quality improvement projects developed in local settings, matching the real need and resourcing available in day-to-day clinical practice. These small-scale initiatives could often be a real game-changer for clinicians struggling with similar challenges in other locations, yet many remain unknown to a larger audience. Therefore, rather than painstakingly develop new solutions, Meds IQ aims to bring together the abundance of existing QI initiatives in a single website, which clinicians can access to improve knowledge, seek solutions, and share their experiences in improving paediatric medication safety. But creating the website was just the beginning. Our next steps consist of building a community of practice around Meds IQ on the one hand, and developing a pathway for good practice to be scaled-up and for the practical tools to be quality assured and accessible to wider audiences. To this end, we are rolling out a UK-wide campaign where we will be asking child health professionals, who are passionate about quality improvement in medicines safety, to help us further grow our online library, implement the resources they find there in their own practice, and promote the use of Meds IQ to their peers. We are also working with RCPCH and other national and international organisations towards creating a review and accreditation process, whereby new solutions, developed in response to real need on the ground, can receive formal recognition and help to build a more standardised approach to solving key issues in paediatric medicines safety. There's a long way ahead of Meds IQ - our vision is that it will become the go-to place for paediatric medicines safety information and a platform for the paediatric community to share problems and together seek solutions - in the UK and internationally. We're already working with the American Academy of Pediatrics and a range of UK nationwide organisations. We're hoping that, in time, our international collaborative will grow to include more partners. 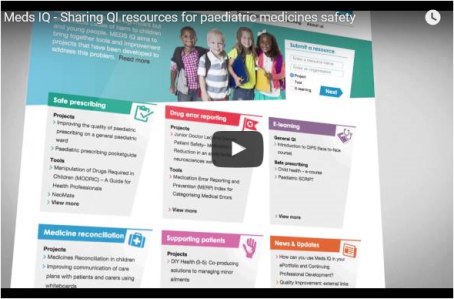 Meds IQ project is part of a wider RCPCH Paediatric Care Online programme, working in partnership with the American Academy of Pediatrics, Royal College of General Practitioners, Royal Pharmaceutical Society, and the Royal College of Nursing. The project is developed in cooperation with a range of stakeholders including members of NHS England Patient Safety, Neonatal and Paediatric Pharmacists Group, UCLPartners Academic Health Science Network, the Paediatric International Patient Safety and Quality Community (PIPSQC), and MiST (Making it Safer Together) paediatric patient safety collaborative. 47. 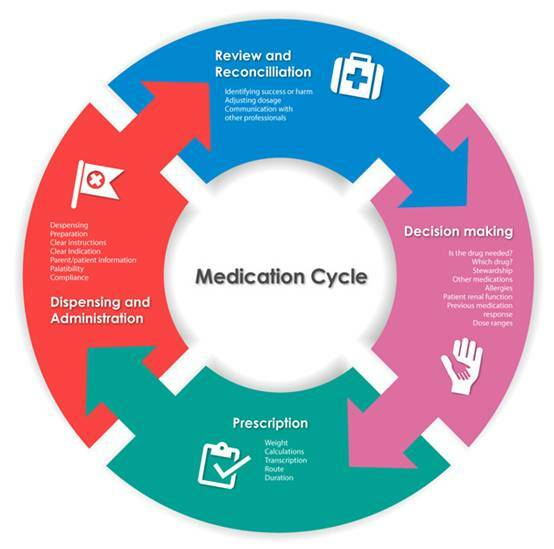 Medication Reconciliation in the Hospital: What, Why, Where, When, Who and How? 64. Preventing medication errors in neonatology: is it a dream?